The Hindu boy, Muslim girl love story has been done to death in Bollywood, and from the trailer Raanjhanaa seemed to be a sweet, possibly fun, version of that template. Thankfully, there’s more to the story than just the issue of a inter-religion romance, however it’s not just sweet and romantic either. There’s much more to the plot than the promos let on, and for that alone, the film deserves a chance, but it’s also quite a satisfying watch. Over the past few days a couple of song promos for upcoming Bollywood releases have been released, ‘Kabira’, from Yeh Jawaani Hai Deewani, and the first song from Raanjhanaa, ‘Tum Tak’, which has been composed by A. R. Rahman. So, ‘Kabira’ first. The other version of this song is my favourite of the album (check out my music review for YJHD), and I like version a lot as well. I’m not so sold on the promo though, it seems like the song is going come over a montage of sad-beardy Ranbir Kapoor, and those kind of song picturizations are my least favourite thing about contemporary Bollywood songs. I prefer the proper rona-dhona (lots of crying) sad songs from a while back. But anyway. Check out the promo below..
Next up, we have a song from Raanjhanaa, which is the next A. R. Rahman album, which is always reason for a bit of excitement and high expectations. The song is quite nice, and will probably grow on me with time, and the video is just more of the sweetness from the trailer. Yeh Jawaani Hai Deewani, is directed by Ayan Mukherji, comes out May 31st. 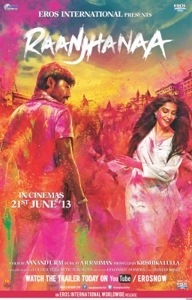 Raanjhanaa, a film by Anand L. Rai, will release June 21st.